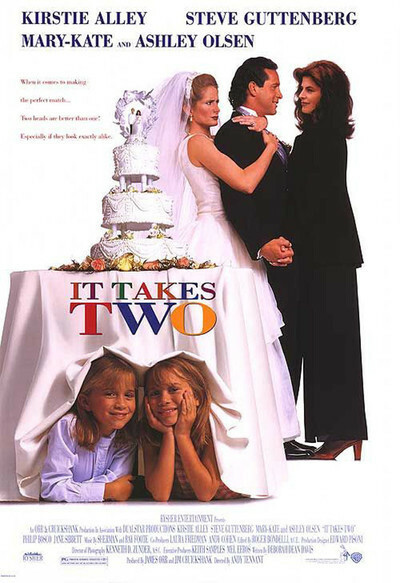 “It Takes Two" is the kind of movie that ought to put rocks in its pockets to keep from floating away. It's so featherbrained and lightweight, it almost elevates its inconsequence into a style. Because the plot is numbingly predictable, that leaves only the performers as a source of entertainment. Luckily, they're quite engaging: Kirstie Alley continues to be the robust girl next door with the big smile, Steve Guttenberg is likable in the Donald O'Connor role, and the Olsen twins, from TV's "Full House," play the two look-alikes - which is a relief, since it's always such a distraction when one actor plays a dual role and you have to spend the whole movie trying to spot the trick photography. The plot, inspired by Mark Twain's The Prince and the Pauper, involves an orphaned street urchin named Amanda Lemmon (Mary-Kate Olsen) and a billionaire's daughter named Alyssa Callaway (Ashley Olsen). Both are living under dire threats. Amanda is about to be adopted into the evil Butkus family, whose father uses child labor in his junkyard. And Alyssa's dad, a widower played by Guttenberg, is about to marry the hateful Clarice (Jane Sibbett), who plans to ship the kid straight off to boarding school. The rich folks go to their country estate, which is across the lake from a summer camp for orphans, donated in memory of Callaway's late wife. Amanda and Alyssa both run away, are mistaken for each other, carry off the deception, and later meet up and decide to conspire. Amanda admires her social worker Diane (Kirstie Alley), and both girls think she'd make a much better wife than Clarice. This is obviously such an excellent idea, and Clarice is such a gushing phony, that it's all the movie can do to prevent the inevitable until the final scenes. Along the way the girls set up a Meet Cute between Diane and Callaway, involving runaway horses, that leads to a food fight and a scene where they jump into the lake fully clothed and almost kiss. Clearly, Callaway does not have his mind focused on marriage. "It Takes Two" is the kind of movie where both the butler (genial Philip Bosco) and the fiancée find out about the other woman by spying her through a convenient telescope. Where both girls are effortlessly able to hide under or behind anything, eavesdrop on everything, and make up plans on the spur of the moment. Where the race against time to the altar involves a Jeep, a helicopter and a horse-drawn carriage. Where the girls are wise beyond their years. Where sweet little blond 11-year-old girls can get adopted only by Dickensian villains. And where the key love scene involves two people lovingly picking macaroni and cheese out of each other's hair. The movie is harmless and fitfully amusing. It contains one clever line ("Guys like him like girls with food names - Cookie, Candy, Muffin. . ."). But someone should have informed the filmmakers that the name Butkus, synonymous in the movie with all that is evil, will always have a certain beauty - indeed, will sound not sinister but melodic - among those for whom line-backing has any meaning at all.